Police Community Support Officer(PCSO) Dan Arthur from the Castle Cary Neighbourhood Policing team returned to Ansford Academy in November to run the second 'Parents and Children Together' evening. 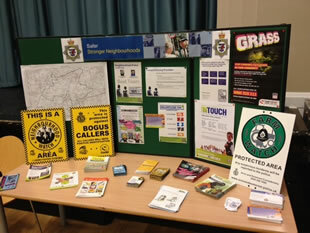 Attached to the academy's parents evening the town PCSO ran the unique event designed to build upon community engagement and rapport with the local community. The first of these evenings was trialled in October and worked well, enabling parents, students and staff to speak with the local police, gain advice and report local issues. PCSO Dan Arthur said "These events are a great opportunity for the police to engage with members of the public who are most likely not to see us in the street, attend our regular beat surgery or town council meetings due to busy lifestyles. "By attending at the parents evening we near enough have a captive audience of people whom have reserved the time in their diaries to attend at the school. Using this time appropriately enables the public to recognise who the beat team are and what we are here for." Vice Principal at Ansford Academy Liz Martin commented "The academy is pleased to have been able to host the local beat team for this project. 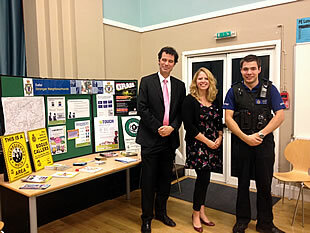 We continue to be a key part of the local community within Castle Cary and are always keen to be involved with partnership working with local organisations such as the police. Such an engagement benefits our students, their parents and our staff and plays a key role in supporting our young people to achieve their full potential." The neighbourhood beat team will be returning to the Academy in April 2012 for their third such evening; it is hoped that the project will be rolled out to other schools and colleges locally in the near future. To contact your local beat team call the new non-emergency contact number '101'. Calls are charged at a flat rate of 15p, no matter how long the duration of the call.